You will find the answers to all your questions in the new 2018 RUNNER’S GUIDE. Collect your singlet in the Marathon Village in the Parc Expo (221 Avenue de l’Europe in Villefranche-sur-Saône). The village will be open on Thursday 15 November from 12 noon to 8pm and on Friday 16 November from 10am to 8pm. It will not be possible to collect your singlet on Saturday, the race day. ► Remember to bring your Collection Card (download from your registration page. You are advised to print it out). ► Remember your safety pins to attach your singlet to your top or your costume. Make sure it is clearly visible! The shuttle service will run between the Parc Expo and Fleurie between 6:30am and 7:15am. Remember that there is no return shuttle service! Make sure you arrive well in advance. Due to the security measures and the number of runners, make sure you arrive at the start 2h before the race. ► Bag drop-off 1h before the start of your race. Remember there is no bag drop-off service for the Family Marathon race! Travel to the town centre and go to the start of your race in complete peace of mind by using our free shuttle service for runners and companions from the P&R parks. ► The shuttle buses will drop you off near the railway station, 800m from the start of the Half-marathon, the 13km du Rhône and the Family Marathon. The shuttle service will run from 9am until 8pm, with one bus approximately every 10 minutes. Remember that the car parks in the town centre will be closed and inaccessible! So far as we are aware at this time, it is extremely unlikely that the town of Villefranche will be completely cut off but we do anticipate that certain entry points to the town will be affected. We have no specific knowledge right now of where the demonstrators will be but we can assume the exits from the A6 motorway will be one of their targets. Unfortunately, we can do no more than recommend that all participants prepare themselves by arriving earlier than originally planned, using the secondary roads. 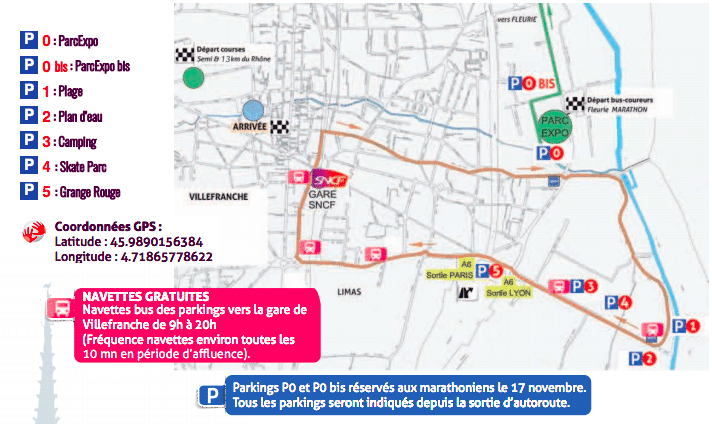 There will be several checkpoints in Villefranche town centre and to gain access to the start areas. ► Please make sure your singlet is visible and only use the bags provided by the organisers. 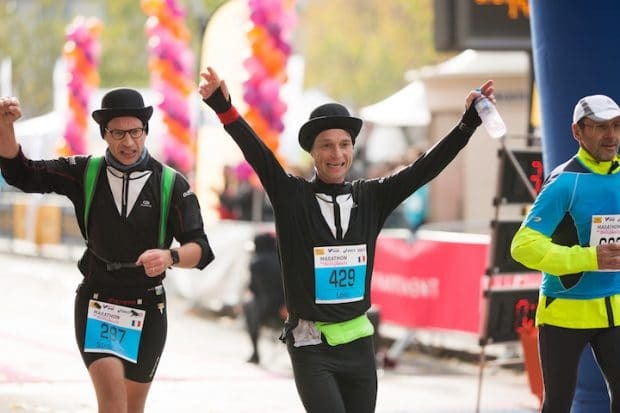 Start of the Half-marathon and the 13 km du Rhône: access only from the Avenue Gambetta, and out of bounds to the general public and companions for security reasons.